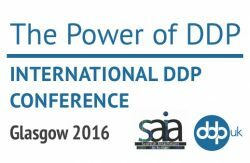 Don’t delay, buy your tickets for the 2016 International DDP Conference in Glasgow on 10th and 11th October. The conference is filling up, there are still plenty of places but we advise booking soon! More information about this exciting event can be found on the DDP UK International DDP Conference 2016, Glasgow event page, including booking forms and the conference programme. Please direct all enquiries to Scottish Attachment In Action and we look forward to seeing you there.